This season at fashion week I made a real effort not to shop. I only purchased two items the whole trip, which is a huge improvement from previous visits to New York. I didn’t really have much free time either, so that made it easier, but I did hop into Barney’s on Sunday afternoon after the Design Darling brunch. Because I didn’t have time to actually try on clothes, I limited my perusal to shoes, handbags and accessories. Because of my obsession with Chloe’s new Drew bag, I kept making rounds to that area of the first floor, which just happens to be right next to sunglasses. If you don’t know me, I love to collect sunglasses. I’m not someone who can just wear the same pair of Ray-Ban’s every day – that just sounds so boring to me! 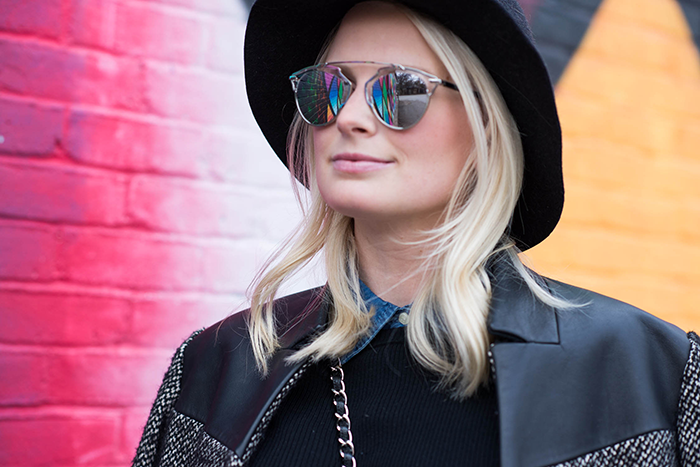 Sunglasses are a way for me to add a different personality to my outfit. Each pair I own is very unique – I own pairs from practically every eyewear designer, BUT, what I don’t have is anything with a sleek silver tone to them. Most, if not all of my sunglasses have gold hardware. As I’m sure you do know, I love have to match. If I’m wearing silver jewelry, or my handbag has silver hardware, I feel like my sunglasses should also have silver. Am I right? Anyway, back to my shopping trip. When I was looking through all the sunglasses, I first stopped by Celine because, well, it’s Celine. But then something shiny caught my eye… I spotted this pair of reflected, mirrored sunglasses by Dior in both gold and silver. I first was drawn to gold, but I had to give myself a talking to. You need to stop buying gold! You have enough! So, instead, I went with the silver – and I couldn’t be happier for it. I’ve already worn them so much! If silver isn’t your thing, this pair is also available in rose gold, copper gold and light gold. Stay tuned to find out what else I got in NYC! I adoooore these sunnies, I’ve been watching them for weeks, if only they would go on sale lol. Cool outfit too, love these jeans. I love these sunglasses! You look stunning. Such a gorgeous look! 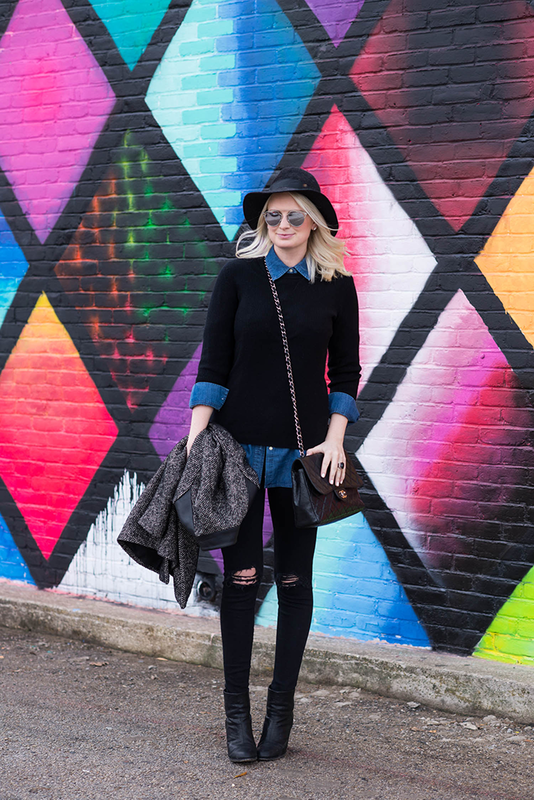 I love the distressed denim and the colorful back drop! Love this look! Your sunglasses are too fun! 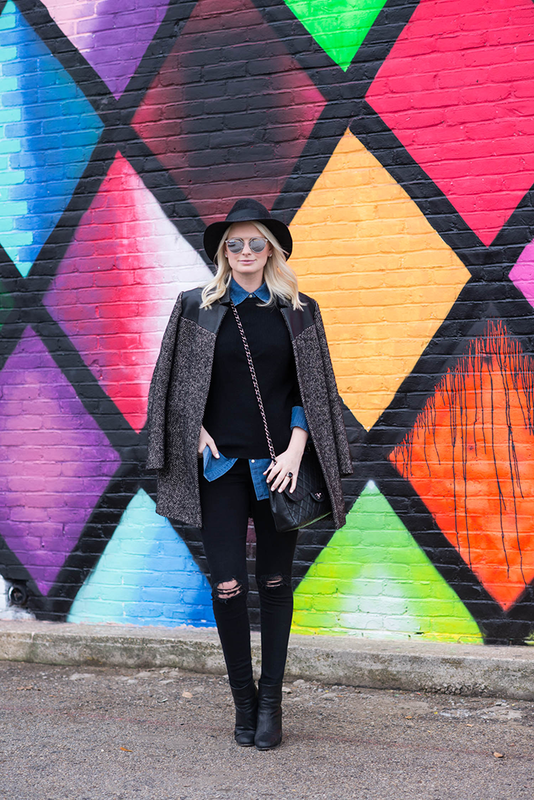 Loving your J.Brand jeans and those Rag & Bone booties! These sunglasses are SO COOL! I’m all for mixing metals but I can hear wanting to stay either gold or silver. Also, is this mural in New York? Because I love it! Love the outfit. Effortless and cool!! Great purchase! I did a little shopping – my visit to Kate Spade Madison Ave with personal stylist Kelly is the culprit! But I have to say, just like you I kept making the rounds on the first floor at Bergdorf’s back to the handbags and then a pair of Tom Ford pumps, but lunch reservations kept me from pulling the trigger! 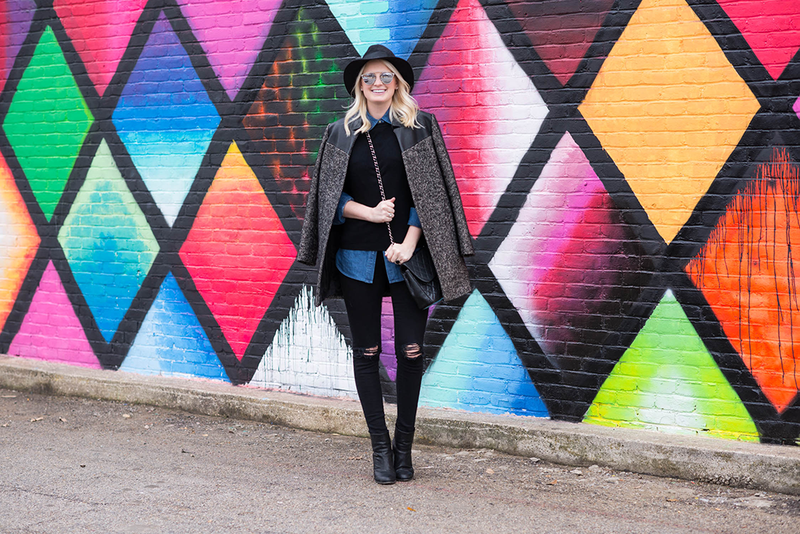 Love this look, that coat is gorgeous and the wall is so fun! Okay these sunglasses are so cool! I love details like this that make for such an awesome outfit. 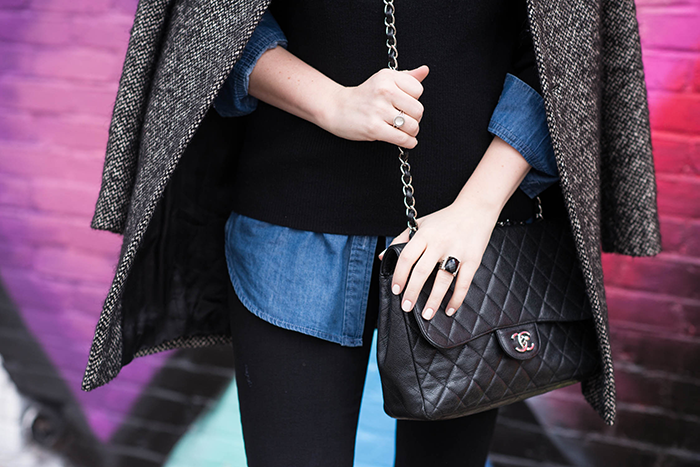 Your layered chambray looks great. 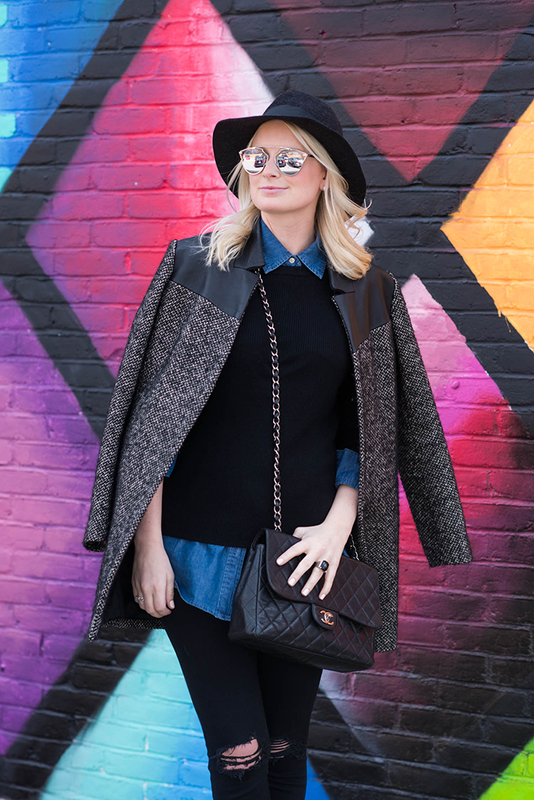 Those sunglasses are the key piece to this laid back look. What GREAT photos, Merritt! Totally obsessed with these sunglasses. Lovely look, I especially adore your coat! I love this tough girl look! It definitely has an edgier vibe than your usual looks (which are always gorgeous), and it’s fun to see you changing it up. I love your rag and bone boots, I have the same pair in suede, I also like to pair them with ripped black jeans, its just such a killer combination. Love that jacket of yours! THOSE SUNNIES ARE AMAZING ! Those sunnies are so cool! Love them with the rest of the look ;) Super chic! So chic! You’re gorgeous from head to toe! I’m obsessed with those sunglasses, what an amazing find!! Wow. I almost didn’t recognize you. Great buy! Cute look! And I am loving the new sunglasses! The sunnies are on my wish list. Ugh. They are SO good!! I’ve got to try them on asap!! Can’t wait to see your other NYC purchase!! I’m obsessed with those sunnies since months. They look so great on you! Love also your ripped jeans and the chanel. 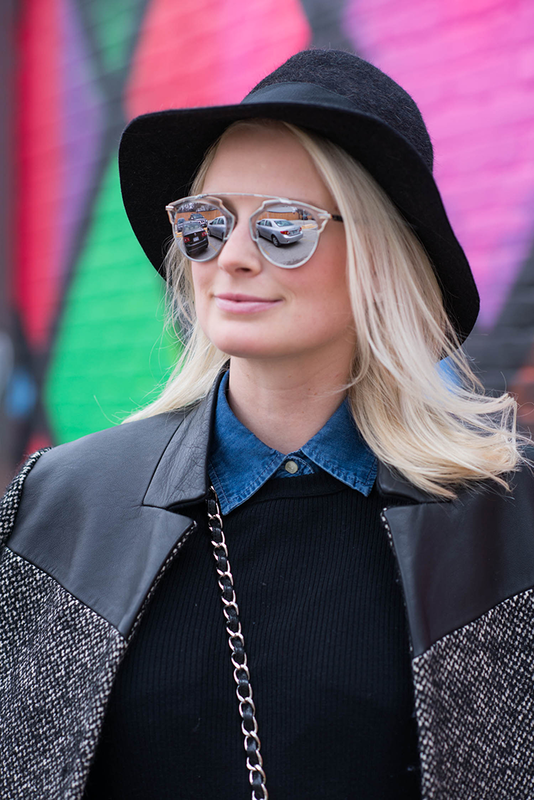 These sunnies are a fabulous choice to add to your collection. They have such a unique look, and I love the silver. Great classic look, and such a cool backdrop.